If you are looking for an experienced and professional place to learn to fly Melbourne, you have come to the right place with Moorabbin Aviation Services. 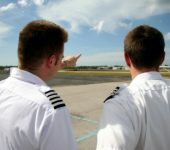 With over 28 years training both local pilots and pilots from all over the world, we have earnt a reputation for providing the qualities and training that airlines are looking for. This is evidenced by the number of our graduates now flying all over the world and the fact that we currently train cadet pilots for China Southern Airlines at our Mangalore Airport campus north of Melbourne. We are a Civil Aviation Safety Authority Part 142 school which means that we meet all the requirements required to deliver this professional integrated training syllabus. The first step in your training will be for the Recreational Pilot Licence. The average student will take about 25-30 hours dual flying (with an instructor) and 5 hours solo flying. In this phase you will learn how to fly the aircraft and most flights will be of about 1 hour duration. You will need to pass both a flight test and theory exam. To become a Professional pilot you will need a Commercial Pilot licence and to get this you will need a minimum total 150 flight hours (most people need a little more) of which 70 hours of the 150 is as pilot in command/solo. To prepare for the CPL you will need to undertake further training with your instructor, build the 70 hours command time and pass 7 theory exams and the CPL flight test. As all flying through to CPL is by VFR and in Single engine aircraft, most students will then go on to undertake their Multi Engine Endorsement (learn to fly an aircraft with two engines) and their Instrument rating i.e learn for fly by Instrument Flight Rules just like the airlines and most other advanced flying operations. Some people may also undertake an instructor Rating so that they can work as a flying instructor and build their flying experience. There is lots to learn but some great opportunities for those wanting to learn to fly Melbourne.